For the book, see The Great Sioux Nation (book). 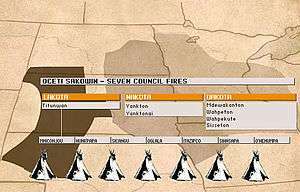 The Sioux people were united in a confederacy of seven members, called the Seven Fires Council. The Great Sioux Nation was the political structure of the Sioux in North America at the time of their contact with Europeans and Euro-Americans. Most of the peoples speaking a Siouan language were members of the Očhéthi Šakówiŋ (pronounced [oˈtʃʰetʰi ʃaˈkowĩ]) or Seven Fires Council. The seven members are sometimes grouped into three regional/dialect groups (Lakota, Western Dakota, and Eastern Dakota), but these mid-level identities were not politically institutionalized. The seven smaller groups were separate members of one confederacy. Two Siouan peoples were not part of the Seven Fires Council: the Assiniboine and Stoney, who lived to the north of the others. They belonged to the Iron Confederacy with the Cree, traditional enemies of the Sioux. The Great Sioux Nation is divided into three linguistically and regionally based groups and several subgroups. Linguistically, all three language groups belong to Siouan languages. Historically, the Great Sioux Nation and the United States have had a turbulent relationship. The last of the great American Indian battles – the Battle of Little Bighorn and the Wounded Knee Massacre – were fought between these two peoples. In one of the oldest, unresolved cases in US legal history, United States v. Sioux Nation of Indians 448 U.S. 371 (1980), the U.S. Supreme Court ruled that the United States was wrong in breaking the terms of the Fort Laramie Treaty of 1868, which forever exempted the Black Hills from all-white settlement. When European Americans discovered gold there in 1874, miners swept into the area in a gold rush. The US government reassigned the Lakota, against their wishes, to other reservations in western South Dakota, breaking up the Great Sioux Reservation into smaller portions. The Supreme Court awarded eight Sioux tribes $106 million in compensation—the 1877 value of $17.5 million, plus interest. The Sioux Nation has refused to accept the award, saying they want their land returned. The money is held in accounts at the Treasury Department, accruing interest. As of 2011, the accounts are estimated to be valued at over $1 billion. The Assiniboine (Nakota), who live to the North of most of the Sioux peoples, speak a Siouan language closely related to the Yanktonai. The Assiniboine were the first of the Siouan-speaking peoples to leave the Eastern Woodlands and move onto the Great Plains. They had developed as a separate people sometime before 1640, when they were first documented as a tribe by French missionaries. The Assiniboine were not a member of the Seven Council Fires. Instead they were members of the Iron Confederacy (with Cree and Saulteaux), and became long-term enemies of the remaining Sioux. Because of this, other Sioux-speakers referred to them as the Hohe, or "rebels". The Canadian Nakoda (Stoney) began as the westernmost band of the Assiniboine, but were referred to as a separate people after about 1744. Decker, Doug. An Analysis of "The Bradley Bill" Proposing to Return the Black Hills to the Great Sioux Nation. [Pierre, S.D. ]: South Dakota Legislative Research Council, 1987. Hans, Frederic Malon. The Great Sioux Nation; A Complete History of Indian Life and Warfare in America. Minneapolis: Ross & Haines, 1964. Ortiz, Roxanne Dunbar. The Great Sioux Nation Sitting in Judgment on America. San Francisco: American Indian Treaty Council Information Center, Moon Books, 1977. Pommersheim, Frank, and John P. LaVelle. 2002. "Toward a Great Sioux Nation Judicial Support Center and Supreme Court: An Interim Planning and Recommendation Report for the Wakpa Sica Historical Society's Reconciliation Place Project". Wicazo Sa Review. 17, no. 1: 183-232. South Dakota. The Great Sioux Nation. [Pierre, S.D. ]: South Dakota Office of Tourism, 2006. ↑ Pratt, Timothy; Maria Streshinsky (February 9, 2011). "Saying No to $1 Billion". The Atlantic. Retrieved 2013-12-28. ↑ Vickers, C. (1951–1952). "The Assiniboines of Manitoba". MHS Transactions. Manitoba Historical Society (3). Retrieved 7 December 2012.